Some projects are just so much fun! 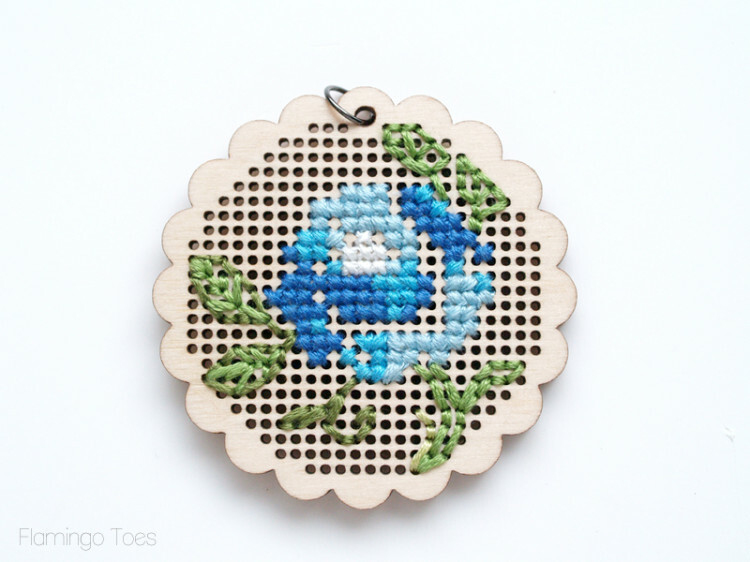 I have had this little wooden floral cross stitch pendant on my to-do list for ages. I bought the little wooden piece a couple years ago and it just got put to the wayside and I kept putting it off, there were so many other fun things to make. Well I pulled it out this weekend and decided to get to work! But I sat for a while staring at all those little holes, wondering what to stitch. Do you ever get stuck on a project like that? After looking around for inspiration I decided to use a little vintage inspiration. Shocked aren’t you. 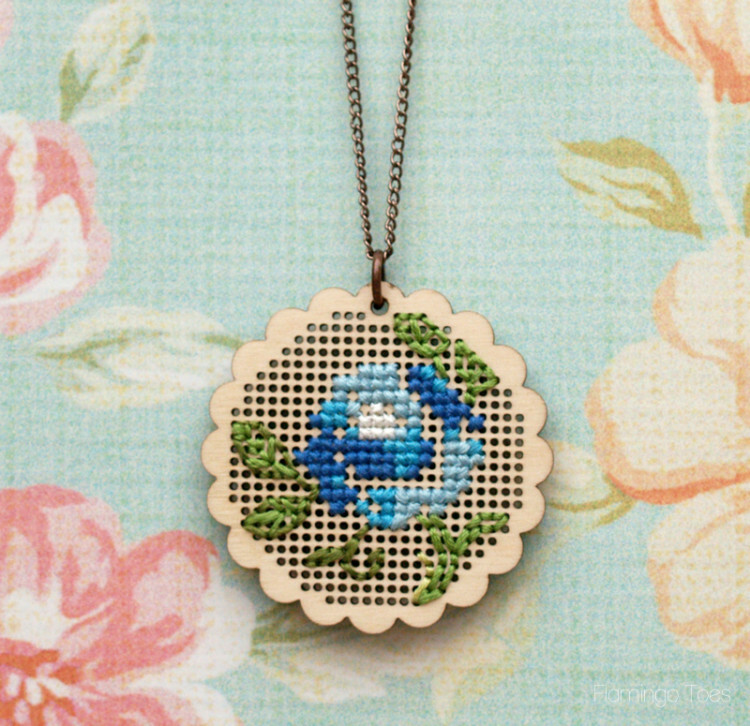 I pulled down my little framed piece of vintage linen and decided to use the flower as inspiration for the pendant. It was a lot easier to make than I thought too. 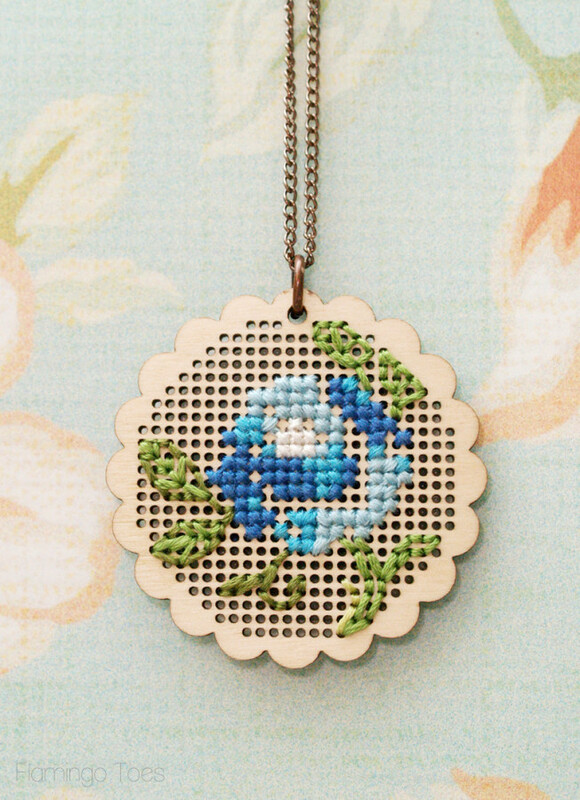 It’s been ages since I did any cross stitch – which is fairly obvious if you look closely at my stitching. It’s a little funky. But you have to get pretty close to see it, and generally I don’t let people get that close to my neck. Wooden Pendant – This looks the same as mine, though I didn’t buy it from this shop so I can’t guarantee that. If you search Etsy there are all sorts of pendants like this in different shapes and sizes. So many cute options. Ok here’s the deal with the patterns. 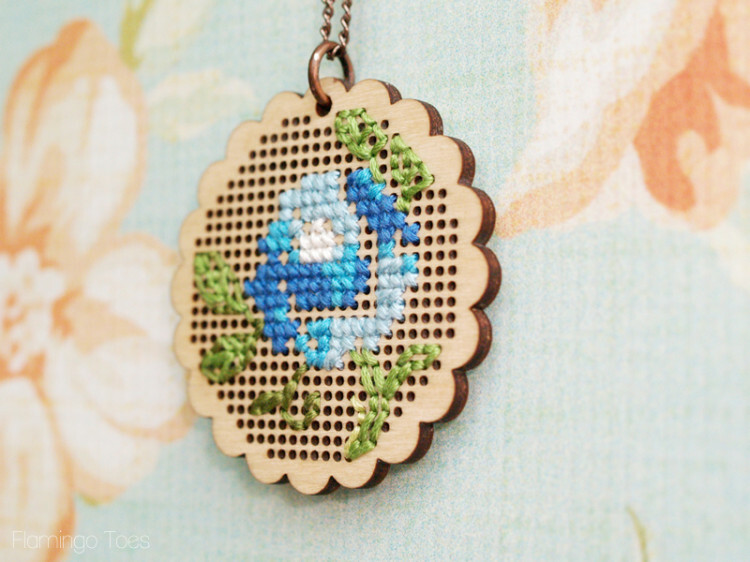 I have a pattern for this flower, based on this pendants holes. If you find a different circular pendant, you’ll need to adjust your design. I also have a blank pattern for you in case you want to make up your own design. Cause I’m nice like that. 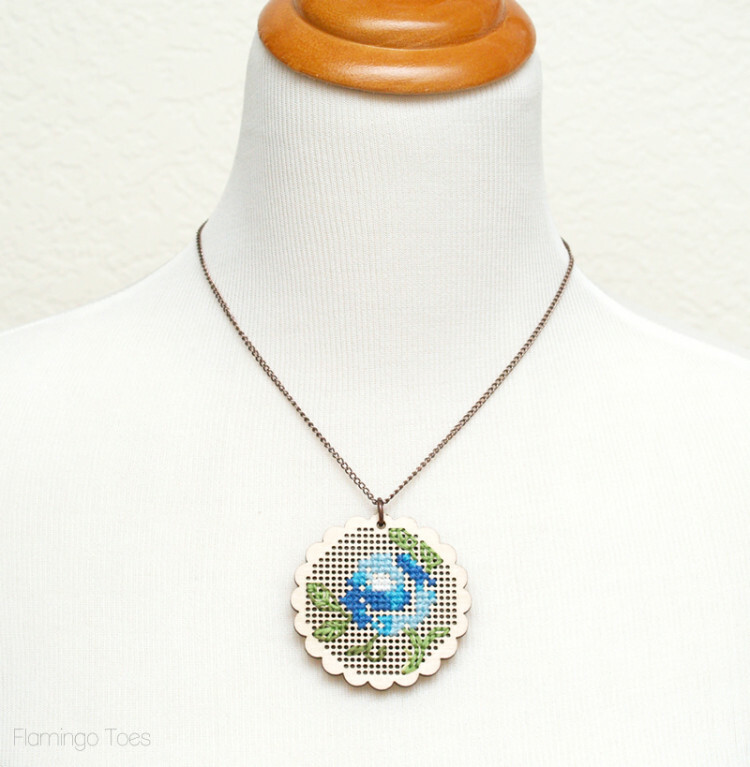 Start by printing out your pattern, or make your own if you are using a different pendant. 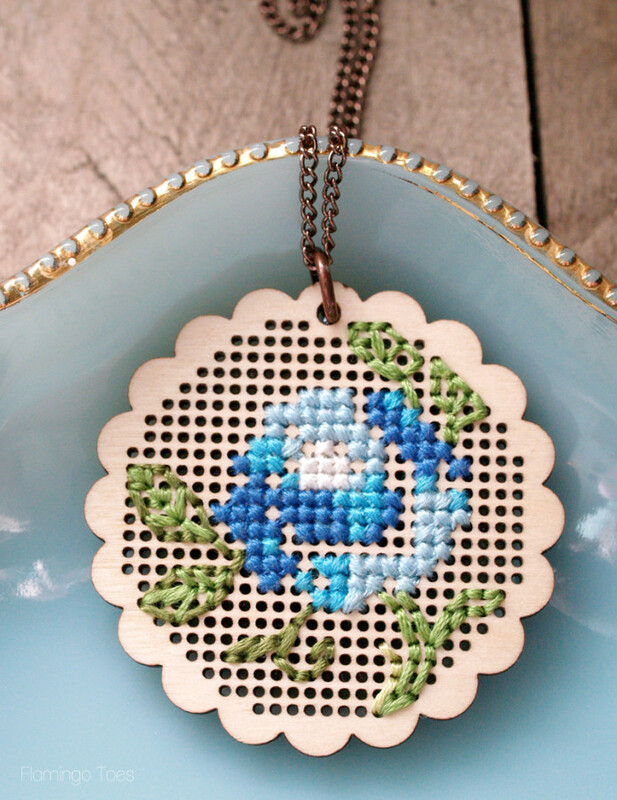 To make the pattern, I recreated the design of the holes in the pendant, then added in the cross stitch design so it looked similar to my vintage linen piece. 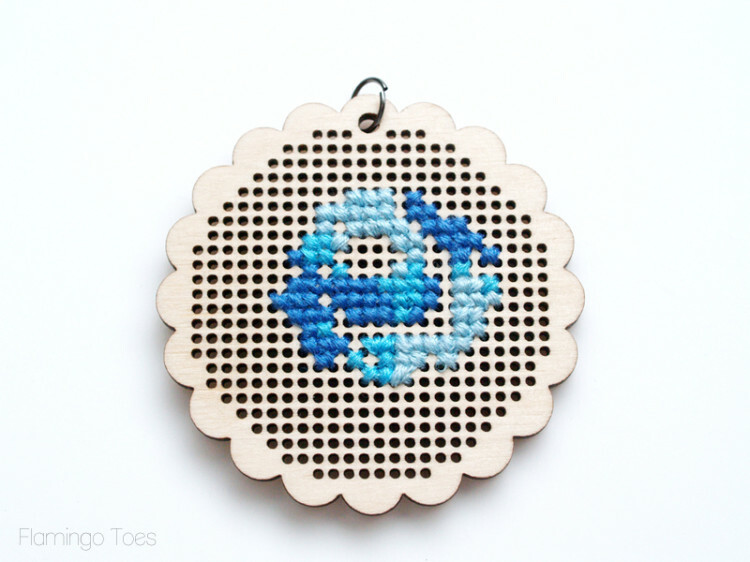 Decide where you’re going to start your stitching and make your first “x”. Now here’s some tips – some of these are a little case of don’t do what I did. – It had been a while since I did any cross stitching and I forgot that you want to keep your stitching going the same direction. So you want all the top lines of the x’s to be going the same way. Mine are a little wonky and when you look closely you can see that some of them go different directions. If that’s going to bother you, make sure they’re all the same way. – I used 6 strands of floss and it got a little tight pulling the needle though. I like how thick the threads are – but I actually broke a couple needles in the process of making the pendant. So you might want to use 4 or 5 strands of floss. – Be careful when you’re changing threads or moving across the empty spaces to make other stitches. You don’t want your floss showing through the holes on the back side. So cut your floss often if you need to. 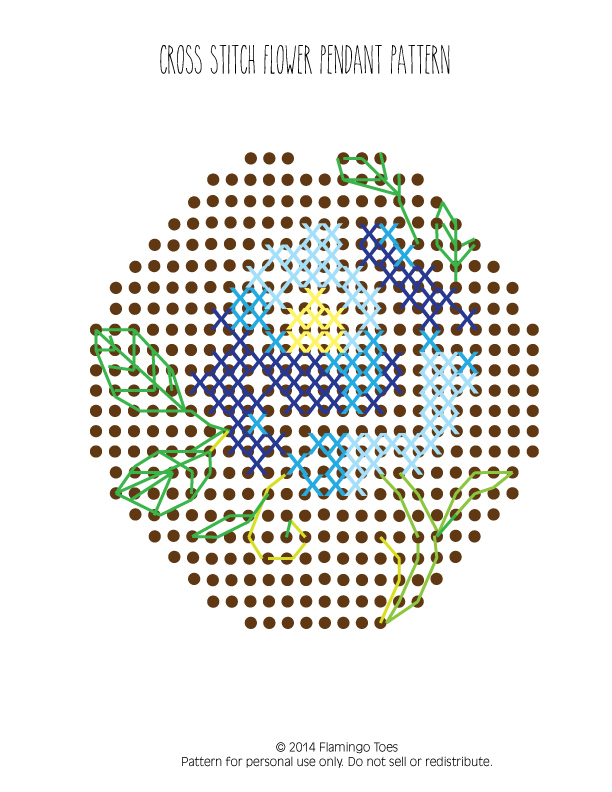 Continue until your entire flower is stitched. Sew on a few leaves and stems. 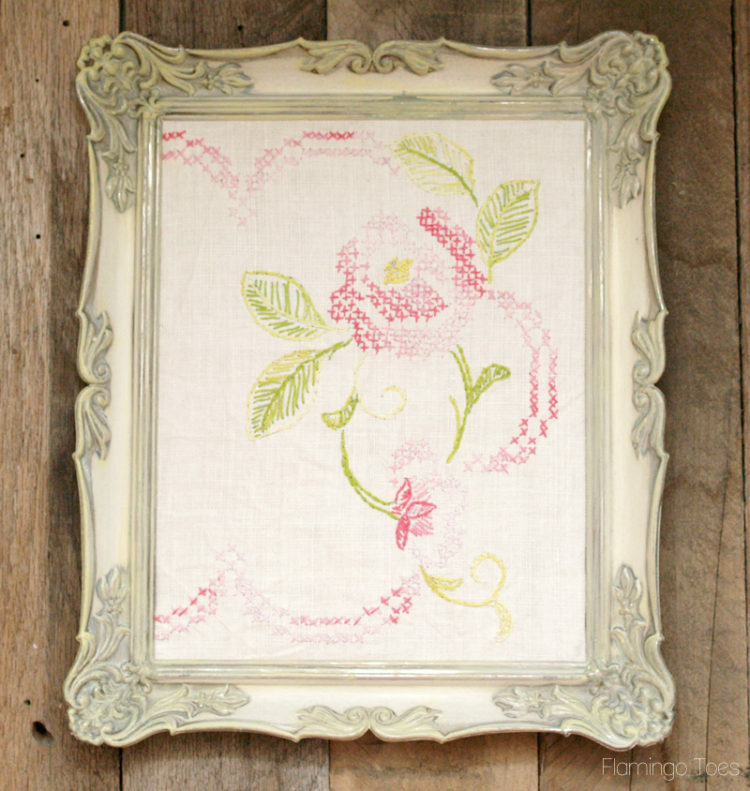 These are more embroidered rather than cross stitched. Just sew them as close to the pattern as you can. 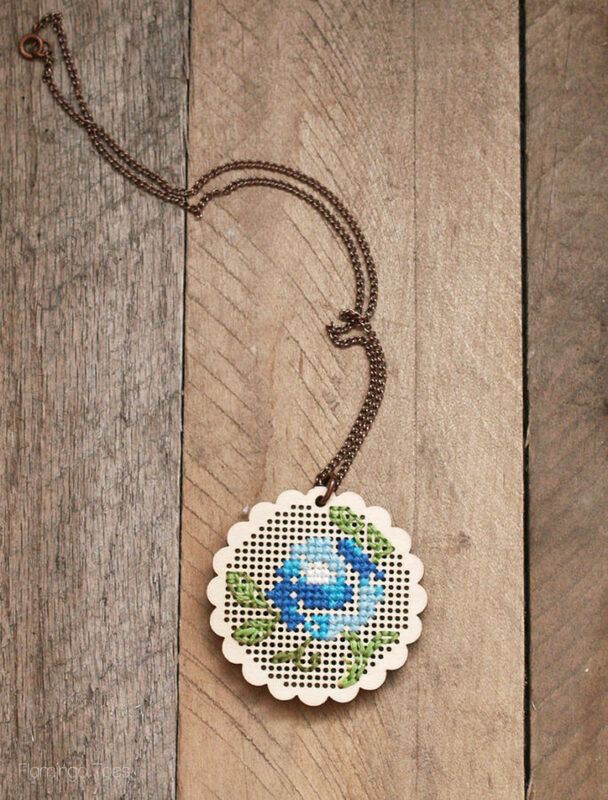 You can choose to fill the whole background of the pendant as well, but I wanted to leave mine so the wood was showing. 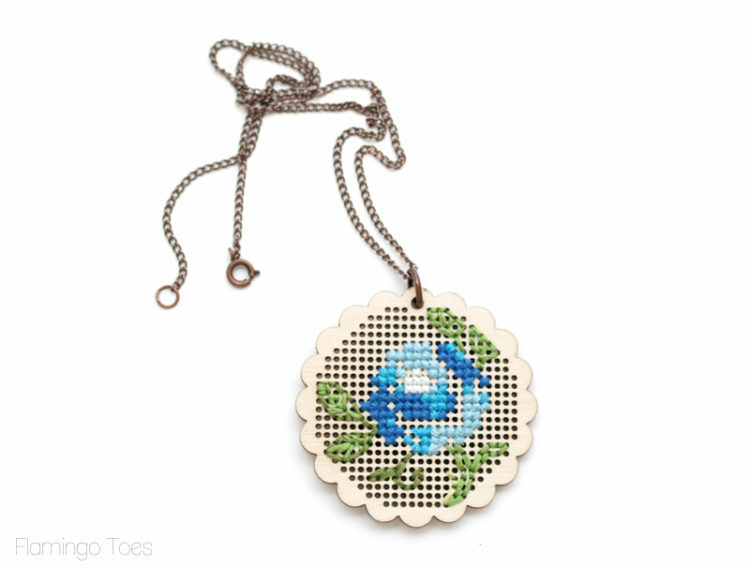 Once you’re done with all your stitching, add a ring to the top of the pendant and add the pendant to a necklace chain. Finish off the back by gluing on a piece of felt. This will make everything on the back look nice, as well as hold your stitching in place. 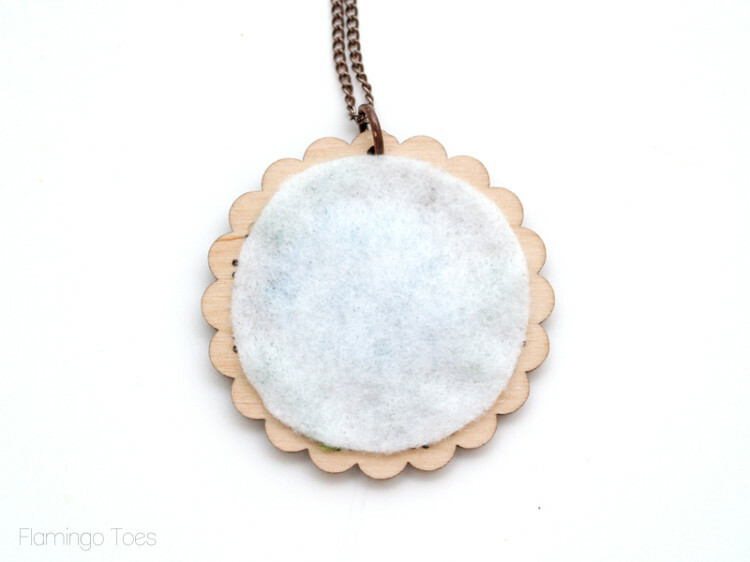 Now you can wear your cute new necklace! I think it’s so fun and I’m already wanting to make another one! What do you think, would you give it a try? I hope so! 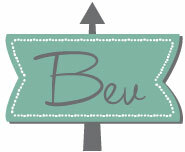 This is so pretty, Bev! I love the floral linen inspirations too. 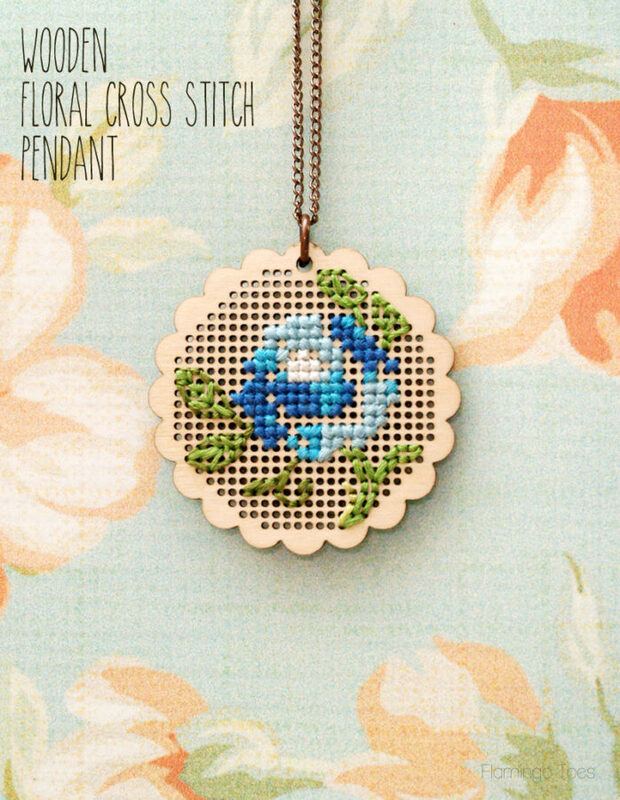 I am definitely going to try and make one of these sweet pendants! Thanks for the pattern and tutorial. That is really special. I love it. 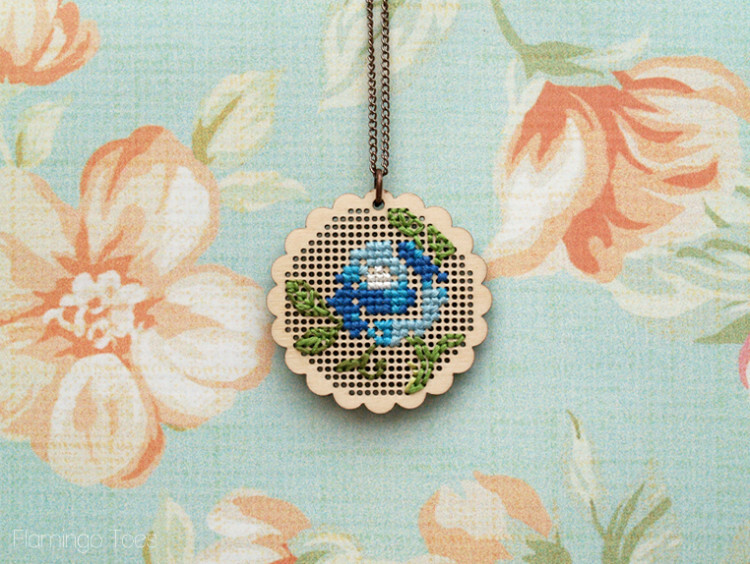 Small counted cross stitch projects are right up my alley. I get bored and lose my place when they are too big. I am the same way Ann! I am so glad you like the pendant, thank you! Ooo I adore this necklace! I am definitely going to have to make you! Your projects are so inspiring! this is so pretty, very creative. Love this Bev! It is the perfect travel sized project for the summer. My daughter wants. 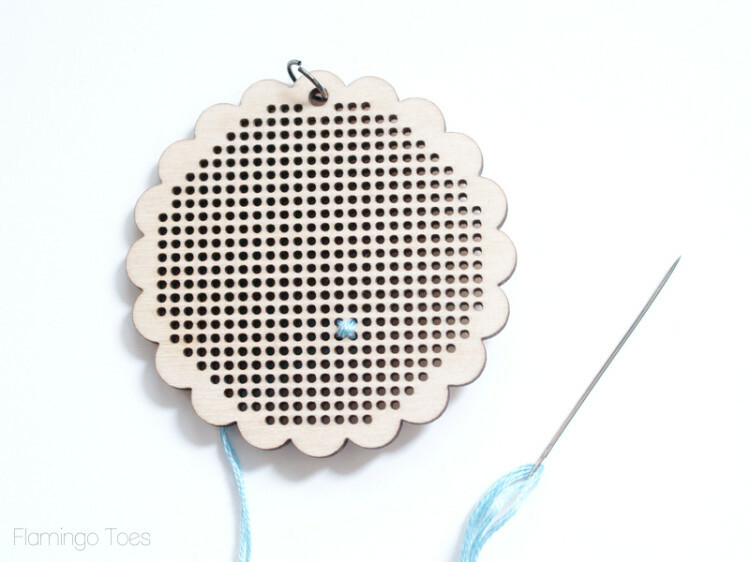 How can I get the perforated wood pendants. I was wondering if you could list the color floss you used for this? Thank you!! There are some links up in the materials section of the post to similar pendants. Thanks! Hi, I’ve made a pendant based on your flower with some modifications to the leaves. Would it be alright if I sold the pendant I made? This is so pretty. I can’t wait to try making my own necklace. Thanks for sharing this with us at the Waste Not Wednesday link party. Can’t wait to see what you’re up to this week. Very sweet! 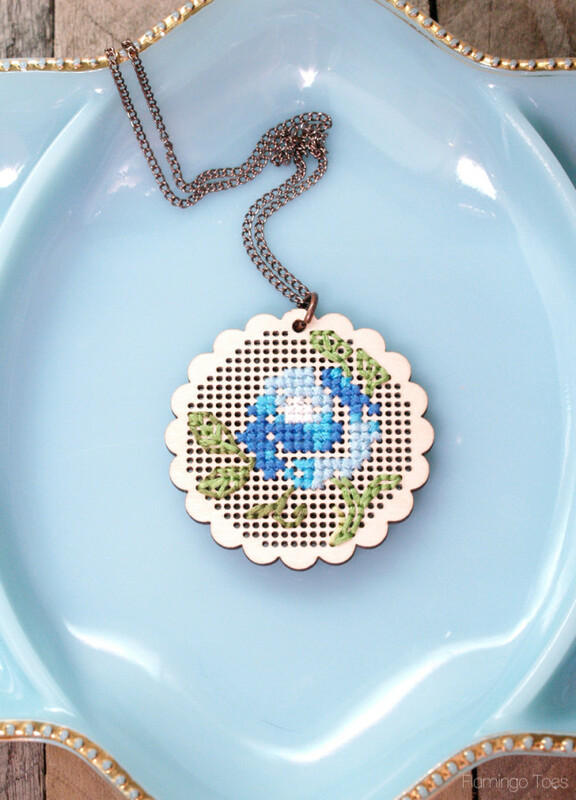 I love cross stitch. Thanks for sharing with SYC.